Frugal and Thankful: It's here, and I love it!! It's here, and I love it!! It's bigger, has more settings and uses less water and detergent. I'll be back for a real post tomorrow but today I'm doing THE LAUNDRY!! And for the first time in my life, I'm really enjoying it. Having clean socks for the boys - priceless (I almost bought a new pack yesterday just so they have some :). But before I go, I want to congratulate Brandy D who is the winner of my latest giveaway (chosen by random.org). And thank you all for entering! ohhhh she is beautiful. What are you naming her? Enjoy the washing, hope you can get it dry ok and congratulations to Brandy D on winning your fabulous prize. Getting-a-new-washer-day or even getting one repaired has to be the best day/s of my life. Have fun doing the laundry. I never thought I'd say this about a washing machine but it's BEAUTIFUL!! Oooh, it shines! Have fun with your new gizmo! Hello from a "determined to be frugal in 2014" blogger in Ireland. 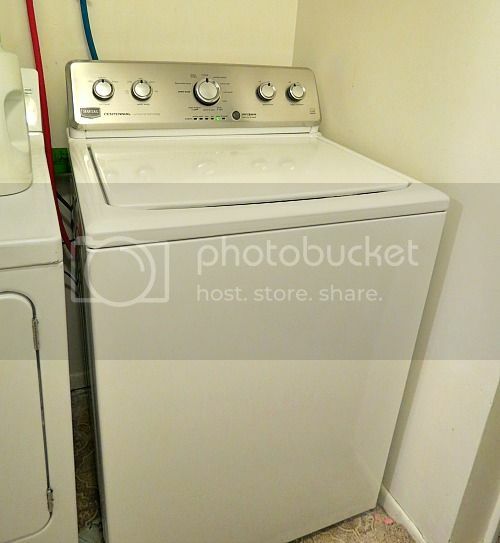 Love your new washer! And LOVE your blog in general.